Villa Sebelah is made from a subtle blend of antique Indonesian teak houses (a Joglo & a Gladak) and modern architecture, the style of tropical Balinese villas nowadays. await you for a moment of extreme relaxation. The main house overlooks this splendid tropical garden. This place includes a kitchen with an iron wooden bar, a dining table, a TV corner, and a lounge with its comfortable sofa as well as a terrace furnished with 4 Soo Santai bean bags. You will find two of the spacious modern bedrooms which have a beautiful garden view thanks to its window bay. Each one has its private tropical bathroom, one of them is equipped with a terraso bathtub. 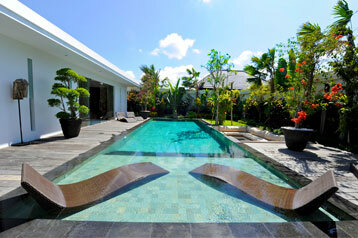 The third bedroom located few steps away, stands in a Gladak which will immerse you in a typical Balinese atmosphere. Villa Sebelah is situated at the end of a quiet alley in the area of Umalas, famous for its peaceful atmosphere close to all facilities. Monsieur Spoon, the best French bakery & pastry in Bali is only 500 meters away, the center of Seminyak is just at 5 minutes and it takes 30 minutes to drive from Bali International Airport. I loved the openness of the villa and the swimming pool is so clear! The air con within the room is just what you need also. The stay was great! Location makes it a nice quiet and private residence. Amazing hospitality! You have review for Villa sebelah?